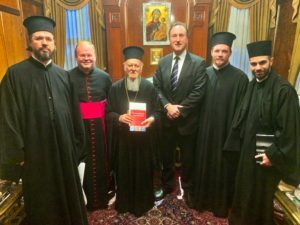 Norman Doe had a private meeting on 16 March 2019 in Istanbul with His All Holiness Bartholomew, Ecumenical Patriarch of Constantinople, the senior bishop of the worldwide Orthodox Church, to discuss the work of an ecumenical panel of religious leaders, jurists and theologians convened by Mark Hill QC since 2013. The panel has members from ten Christian traditions worldwide – Catholic, Orthodox, Anglican, Lutheran, Methodist, Reformed, Presbyterian, Baptist, Old Catholic and Pentecostal. The Panel’s Statement of Principles of Christian Law (later published as (2017) 19 Ecc LJ 138-155) suggested and initially drafted by Norman, formed the basis of his book Christian Law: Contemporary Principles (Cambridge UP, 2013). The Statement is being fed into the work of the World Council of Churches and its Faith and Order Commission, which in 2017 at Geneva established a partnership with the panel. Several national events to use the Statement to foster greater ecumenical understanding have already taken place in venues as far apart as Uppsala and Sydney, and further such events are planned for the coming months in Oslo, London, and Rome. The Ecumenical Patriarch welcomed the Statement as a “means of unity and collaboration” between Christians of different traditions. The Ecumenical Patriarch is holding a copy of the Statement. Also in the picture with Norman and the Patriarch are two students on the Cardiff LLM in Canon Law: the Ven Gavin Kirk, Archdeacon of Lincoln and Deacon Aetios (far right).